Sibanye-Stillwater’s workers to embark on sympathy strike - SABC News - Breaking news, special reports, world, business, sport coverage of all South African current events. Africa's news leader. Tags: Rustenburg, AMCU, Joseph Mathunjwa, Sibanye-Stillwater, Platinum operations, Secondary strike. Sibanye-Stillwater workers are expected to embark on a nine week strike led by trade union AMCU. 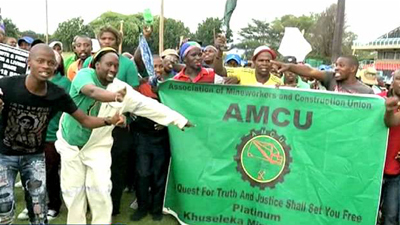 An estimated 12 000 mineworkers, affiliated to the Association of Mine Workers and Construction Union (AMCU) will go on a secondary strike at Sibanye Stilwater‘s platinum operations in Rustenburg next week. This, in solidarity with fellow members currently on a nine-week strike at the company’s gold operations in the West Rand and Free State. The planned strike action was announced by AMCU president Joseph Mathunjwa during a mass meeting in Rustenburg on Wednesday. Hundreds of mineworkers gathered for the announcement that they will be going on a sympathy strike. The strike is said to commence on Tuesday with the entire Sibanye-Stilwater Platinum operations expected to grind to a halt. It is expected that mine workers will be transported to the Chamber of Commerce offices where they will be camping until their demands are met. AMCU President Joseph Mathunjwa says that Niel Foneman is not feeling the pinch of the stirike. Masutha says the union planned shutdown will send a strong message to mine management. AMCU says they will continue with negotiations with the hope that the impasse at their gold operations will be resolved. Rustenburg AMCU Joseph Mathunjwa Sibanye-Stillwater Platinum operations Secondary strike. This entry was posted on 17 Jan 2019,06:12PM at 6:12 PM and is filed under Business, News, Homepage Latest Stories Slider. You can follow any responses to this entry through the RSS 2.0 feed. Both comments and pings are currently closed.